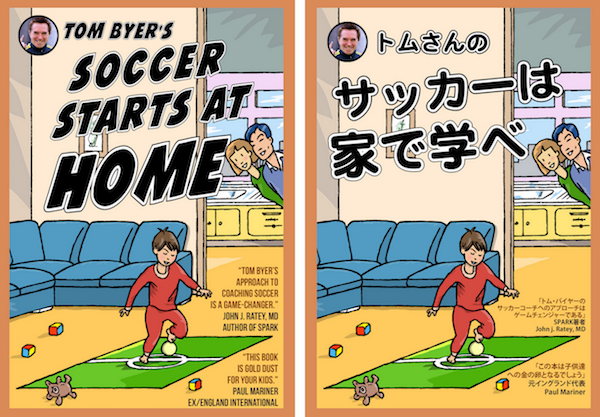 HBO, which is featuring Byer in an edition of “Real Sports with Bryant Gumbel” titled Soccer Sensei, calls him a “soccer guru” with a “plan to rescue American men’s soccer.” Byer has recently been charged with launching a U.S. Soccer-supported “Soccer Starts at Home” program in Seattle. Byer asserts that the under-6 age group has been the most misunderstand part of soccer. SOCCER AMERICA: We have had in the USA, for more than a decade as far as I know, companies offering soccer classes for children from 18 months old and up. How is what you’re advocating different? TOM BYER: There’s a stark contrast, and this is what it is: Development for 3-, 4-, 5-year-olds will almost never happen in a collective environment. My kids played in one of these little kicker things for three years [at a Japanese kindergarten that outsourced to recreational companies]. I can tell you this much: They learned absolutely nothing. What are these little kickers programs good for? They’re good for social development, they’re good for learning to play with other children. They’re good for giving mom or dad extra time. It gives the kids first exposure to the game, but I know for a fact, unequivocally, if I as a father or parent, hadn’t taken the responsibility into my own hands to teach my kids to basically master ball skills, they would have never learned them in a collective atmosphere. That’s the whole crux: soccer starts at home. Small foot, small ball. I started in the house with the little balls for my little guy who had just started walking. And I discouraged him from kicking – if he kicked he's going to run inside the house and probably fall over and maybe even get injured -- but I encouraged him to protect the ball and pull it back and keep the ball close to him. But it wasn't until I starting really putting the development phase under the microscope that I started connecting a lot of dots and started really absorbing and understanding how player development took place. The role of the parents is so important in the development of a young player. That’s why it’s important to have a much more intelligent, knowledgeable, engaging parent of a child and I maintain that this is the game-changer. That’s happening in a lot the other countries where the culture is very conducive to teaching and developing children because soccer is so deep in the culture that parents have a much better understanding of what to teach the kids instead of constantly kicking the ball. Yes, when you study their stories you’ll find out their soccer started at home. ... Where are more Landon Donovans, Christian Pulisics and Clint Dempseys? Christian Pulisic’s parents had a massive influence on him. Clint Dempsey started playing inside his house. I read an interview in which Landon Donovan’s mother was asked when she bought him his first soccer ball. Her answer was I didn’t have to, we already had balls scattered all around the house and he played with his siblings. When it comes to parents playing soccer with their children, you seem to discourage them from passing the ball with them. I’m sure I can find plenty of great players who passed around with their parents. Are really saying parents shouldn’t pass the ball back and forth with their kids? I’m not saying that at all. What I’m saying is that you can do that along with other things. It depends on what the age is. But to me, to start passing the ball back and forth to a ÷2-, 3- or 4-year-old seems to be counterproductive. You’re teaching the child from a very young age to get rid of the ball. Now, this the part I think everybody is mystified with because the reality is the game is a passing game. It is. So there’s a bit of contradiction. What I’m saying is, you look at best players, the best passers, the players who understand combination play, etc., they mastered the technical skills at a very young age. The sport is such a technical sport that it takes a ridiculous amount of time practicing to become good. So what I’m saying is that when you get a kid from a very young age to grow up learning to possess the ball, pull the ball back with right foot, left foot … learning to stop and start ... Do all these things core skills, you’re essentially building the building blocks of the game. We’ve become so fixated on methodology of how we coach. We look all over the world at national curricula … Everybody is trying to invent the wheel, where for me it always comes down to the same core belief: the technical component is the foundation upon which all the rest of the game on depends on. The truth is that technical skills are rarely the result of coaches. You talk about parents demonstrating skills, and about the soccer ball turning into a child’s “best friend.” But there’s a passage in your book: “The child must learn to control the ball and move the ball and stop the ball at will. With both feet.” Is there a danger that parents could become overbearing, trying to coach their kids too much to learn difficult skills? I try to draw a big distinction between coaching and teaching. Separate the idea of a parent teaching something rather than coaching. I don’t like to use the word coaching for parents because I believe we teach our kids and so we can prepare them so that when the coach receives our kids he or she can start coaching. It’s a collective environment. I’m throwing a lot of things out there and I’m putting out my life experience. I don’t believe there’s one size fits all. Everybody knows kids develop at a different pace, different speed, different maturity. But what I know is, what I did with my two boys anybody could do. It’s not like you’re out there with the bullwhip forcing your kids to play. But the whole idea is if you’ve got a lot of balls around there’s a good likelihood that if you can model what it is you want the kids to do, which is the basics of pulling the ball back with the right foot and the left foot and just gliding the ball along the floor and just basically stopping and starting -- and encouraging the sole the foot -- you’ll find that kids become more engaged. Also it’s very important -- the relationship between child and parent. Children enjoy showing their parents something they’ve learned to do. Is your approach mainly designed for countries that don’t have a rich culture? I’ve got about 70 or 80 slides in my PowerPoint. It’s very interesting, interactive, lots of videos, it documents the development of my kids since they could start walking until now, fast forward, they’re now 9 and 11 years old. I’ve taken that presentation around the world and I’ve basically tried to expose myself to as much criticism as I possibly could. And some of the highlights being, being invited to Manchester United and presenting to Ryan Giggs, who in turn asks me to present to Gary Neville the next day. Or Rio Ferdinand who flew all the way to China. He wanted to see the presentation. Or last year, Dec. 7, in Geneva I was asked to present to nearly 50 technical directors from UEFA. Or the owner of AS Napoli, Aurelio De Laurentiis, who invited me into his home in Rome because he wanted to see the presentation. The reason I say this, is not because I’m looking for a pat on the back, but I’m trying to convey to the world that I’ve put this in front of the so-called experts. Recently I was invited to Ajax. I have friends there and they asked me to present to the Ajax academy director and he was so impressed with the presentation he asked me to go over to the Dutch federation and I spent a couple hours over there with one of the top guys from the coaches education department. So, when I see the reaction from people in the soccer world who are at the top of the games, the movers and shakers of football worldwide, and what I’m finding is this under-6 age group has been the most misunderstand part of soccer. When I was growing up, I could juggle 10,000 times. My biggest idol was Tommy Mulroy, the juggling genius. But if I did it over again, I would spend a lot more time mastering the ball with it on the ground. I believe juggling is useful because it’s a fun thing for kids to do on their own, and it’s about timing. Anything to get the kids active with ball is good. But one issue is that it’s ridiculously difficult for young children to become good at it. Whereas it’s much easier for them to master skills with the ball on the ground. For the littler kids, the other core skills are more important than juggling. My kid’s an excellent juggler, but that could be because he got good at the other skills first. I wouldn’t put a massive emphasis on juggling but I wouldn’t debunk it. The HBO special touts your “plan to rescue American men’s soccer.” And U.S. Soccer has announced your “Soccer Starts at Home” is part of its Grow Fund initiative. Tell us about that. Here’s what’s happening, and this is a big misunderstanding. People think I’ve been brought in because I’m this big tsar, that I have these magically powers and have these endless resources. I’m in a pilot program with U.S. Soccer to put a program in place in Seattle. Only Seattle. We’ve got three stake-holders. U.S. Soccer. MLS. And the youth component. What I’m trying to do is position ourselves as the glue, the stickiness that we can bring these three groups together to agree on one thing: That soccer can start at home and that the parents play a critical role. The elevator pitch: Can you get a 6-year-old boy or girl, before they cross that line into organized soccer, to have some technical competency? If you can, that kid is much more likely to become a better player. That kid is much more likely to stay in the game. That kid is much more likely to have fun. 14 comments about "Tom Byer: Look to parents, not coaches, to create skillful players". Bob Ashpole, November 22, 2017 at 12:21 p.m. Conventional thinking is that development of sport specific skills during these early years is unimportant, but is that inconsistent with what Tom Byer has done? Most children's activities with a ball involve kicking or throwing a ball, which are considered general athletic skills. Tom stresses ball manipulation with the feet, rather than kicking or throwing. Outside of soccer that doesn't happen, but these skills seem to me more like general rather than sport specific skills in contrast with a specific soccer move like the Cruyff turn for example. His emphasis on parents is consistent with the shrinking size of US families today. During the post-WWII baby boom years, 3-child families were typical. Today it is not. Tom's experience in China is going to be also consistent because 1-child families are the rule there. While depending on parents to play with children might not seem optimal, in a 1-child family there is no other alternative. I am happy to see USSF working with Tom Byer. He is innovative in a direction that I haven't seen anyone else moving in. frank schoon, November 22, 2017 at 1:41 p.m.
Tom Byer’s statement is so true about kids of 3,4,5 years (and older young kids) learn little of anything in a collective environment. That is Common Sense, for if he understood what street soccer was all about he wouldn’t have wasted his kids time in this Japanese program. This is why in my first game with Ajax I dribbled and beat 7 opponents and just lost the ball for I was clueless about looking for an open man. Street soccer in the early stages is all about INDIVIDUALISM not COLLECTIVISM. INDIVIDUALISM is a must, in other words , it is what I call the BALLHOG stage. All kids must go through the BALLHOG stage in order to get CONFIDENCE with the ball on your feet AGAINST opponents. It is a MUST stage of INDIVIDUALITY a kid needs to experience. Furthermore it is the only plausible stage for a young kid to experience FIRST ,for he is not ready to UNDERSTAND OR THINK the game , it is all INSTINCT ; you can’t expect the mental part of the game with these young ones, PERIOD. Unfortunately,the word ‘BALLHOG’ has a NEGATIVE connotation by youth coaches and parents for they don’t have a clue of how important it is to go through that stage as part of a youth’s development. This is all simple ABC’s if you only study the ELEMENTS of street soccer. frank schoon, November 22, 2017 at 1:52 p.m.
without parents, they learned from older ,better players playing in mixed ages. I agree that technical skills are rarely a result of coaches, but that’s not 100% true ,especially if the is a coach isn a great technician of the game. This is why I prefer that coaches in youth soccer especially 14 years or below were/are OFFENSIVE, CREATIVE TYPES and not coaches who were DEFENSIVE TYPES. frank schoon replied, November 22, 2017 at 1:54 p.m. I agree that technical skills are rarely a result of coaches, but that’s not 100% true ,especially if the is a coach isn a great technician of the game. This is why I prefer that coaches in youthsoccer especially 14 years or below were/are OFFENSIVE, CREATIVE TYPES and not coaches who were DEFENSIVE TYPES. frank schoon replied, November 22, 2017 at 1:55 p.m.
frank schoon replied, November 22, 2017 at 2:08 p.m.
Bob Ashpole, November 22, 2017 at 3:16 p.m.
Frank I agree, heck everyone I suspect agrees, that practicing without pressure, without context, is worth little in terms of soccer training if not followed by dribbling against opponents. I suspect Wiel would have agreed with you and Cruyff on that point. For a long time that I know of Coerver Coaching in the US has covered the progression from unopposed ball mastery exercises to SSGs in their training. But your point is related to tactics, not developing dexiterity with the feet which is what Byer is trying to have parents do. This is preparation for organized soccer at age 6. I started off rolling a ball back and forth with my kids as soon as they could sit up. Was it soccer? No. It was playing with a ball. Instead of looking at the game through tactical eyes, think about athlete development as training athletic movements. Then what Byer is proposing, at the very start of movment development, should make more sense. frank schoon replied, November 22, 2017 at 4:34 p.m. In that situation just running and doing things with the ball free, or whatever to get them use to being with the ball...what ever floats your boat. I didn't mean tactically as related to the opponent's team was but tactically only as related in a 1v1 situation, mano e mano. I think what you're doing is spot on. But after that you can do this;The first thing I teach the young ones is the pullback and once they learn it after a few minutes of exercises ,I explain to them when to use it and in what situation. This exercise I would have 2 lines facing each other. Then I tell them to dribble at each other and the last moment before you bump into each other Pull the ball back. Sometimes during a small sided , in a particular situation , I will show them what kind of move you can do to get out of this particular situation. frank schoon replied, November 22, 2017 at 4:52 p.m.
Bob, the coaches of clubs in my youth like at Ajax were so fortunate as compared to today because the kids were so good ,skilled wise then . This is why Cruyff and Rinus Michels stated that street soccer was the greatest training grounds for players. Wiel Coerver tried to duplicate and substitute what was lost when street soccer sort of dissappeared due to all the cars.. It was no substitute however for he left out certain elements in his skill training. Like explaining when to do the moves, he never mentioned playing on concrete, or the lack reading the opponent's counter moves. His stuff was doing the moves for the moves not as related other factors....But right there is nothing better to follow although it is flawed, but that's all we have. I have never employed the Coerver Techniques for I followed the street soccer way of learning, which teaching the move, who you do the move and it benefit, and then do it under pressure and besides there tons of moves to show. Kids in Holland have taken the Coerver to a higher level sophistidation that looks better in a circus but not on a field. James Madison, November 23, 2017 at 6:15 p.m.
All I know is that ever since I began playing with my sons in the back yard when they were 5 and 3 and they began spending time playing with each other, they were among the best players in their respective age groups; and the same has been true consistently for the other sons and daughters of my fellow youth coaches and other parents who have introduced their children to the ball on their own at very young ages. frank schoon replied, November 23, 2017 at 10:44 p.m.
Ric Fonseca, November 24, 2017 at 7:54 p.m.
Folks, so sorry, but to rely on parents to help out a child develop his/her skills, only and unless that parent has had some personal experience in/with the sport, I strongly doubt they will be able to do so. Yeah, ok, I too had our kids play indoors with a size, 1 then size 2 ball, even a tennis ball, however, as they grew we - my wife and I - were insistent they continue their skills-buildings out in the back yard. The author has good intentioned advise, yet my very own experience, yes, going way back to the local ayso-k-league was more painful (for me) than for the parents. Alas, the kids I was assigned by the then area commissioner (an Argentine who thought and felt he knew everything there was/is to know about futbol, well, yes as a player, but as a teacher, he sucked!) 95% of the Mommies and Daddies, were completely foreign to the sport. And, alas again, this was quite some time ago, and some things have changed with more and more parents knowing something about el jogo bonito, futbol-soccer. And so, Mr. Byers may have honed his skills elsewhere, but as usual, there is a helluvalot more to this story that is written hereon. frank schoon replied, November 25, 2017 at 8:59 a.m.
Ric, what you say is true and by the looks of it this is about the very young ones, which is fine if they have parents like you or like Fan of Soccer to teach them. But ofcourse there are so many parents who lack knowledge about the skills and that is where the problem lies. Maybe he has a point that parents play a role,although not for me or the thousands of kids in latin countries and neither for you, but in a country like the US where soccer is still not part of a culture,so to speak, it can help somewhat by introducing soccer to a kid by laying balls around the house or backyards. As I look at his video, his kids have been well versed in to Wiel Coerver skill training methods not by him teaching the skills. Bob Ashpole replied, November 25, 2017 at 6:36 p.m. The young player I recall with the best athletic movement was the child of two former college athletes. Children with athletes for parents have always had the advantage over other children. It is not just genetics or the parent's knowledge, it is also the family environment that the kids are raised in, an environment that values competitive athletics.